The story I’m about to tell really did happen. The names haven’t been changed nor has the actual events as they occurred, although I decided to add a few embellishments to give my story some of a hometown flavor which I thought would be appropriate to express that period of time along with the participants who experienced the drama of that day. Mid June, the place is Paterson Technical and Vocational High School. The year was 1965 and the clock points to 4:07 p.m. KABOOM! An explosion occurred. Afterwards it was said that a group of teenage boys were examining something in their classroom after hours. They were completely unaware of the impending disaster when an unexpected shockwave momentarily engulfed the students. Fortunately, there were no major injuries, no panic or debris from fall out. But, the effects of that blast were instantaneous and overwhelming. We now have knowledge that the explosion was caused by the removal of the lid off a shoebox. The device was later taken out of the building by the authorities for further investigation, and the individuals who experienced the aftermath were released a short time afterwards and sent home. I grew up on the East side of town and I lived in a foster home. I mention my childhood circumstance because of the moral value I feel is needed to better understand the true nature in the meaning of my story. I attended Public School 21, then later Paterson Technical and Vocational High School. I’m one of those guys who always likes to build things, so the choice of “Vo-Tech” (as we later called it) more than satisfied my future goals. For those of you out there who were students back in the 1960s you will remember that Paterson Tech was gearing up to move into a new facility just across the river in Wayne. One of the projects at the time was to build an architectural rendering in a scale model version of the new school and grounds. I am happy to report that our class had the privilege to work on that project. Our teachers and shop instructors didn’t really have to worry who was or wasn’t in class because your attendance record was printed on that “Card.” You punched your “Card” in or out of school and if you were sent to the principal’s office (Mr. Hartman, known to us as “Big Hank”)….Well all I can say is that there were plenty of empty seats during the freshman year. I guess a lot of guys thought a trade school was an easy push over, but it wasn’t. Vo-Tech happened to maintain extremely high academic standards and if you didn’t “tow the rope” as they say, out the door you went. Have you ever wondered about certain events that just unexpectedly “pop up” out of nowhere but leave a lasting imprint on our memories? Are they mysteriously predetermined and just meant to happen or perhaps they are caused by forces beyond our ability to predict or control. Maybe they are even caused by some form of energy that’s hovering about waiting for the right moment in time to pounce on their next victims as an experiment to see what will happen. I know what I just said sounds ridiculous and maybe delusional. I guess possibly it could be the direct result of watching too many episodes of “The Twilight Zone” when I was a kid. But I think I have your attention and let’s face it, you have to agree there are mysterious things we experience in our lives that we can’t explain. Our class consisted of around sixteen students and the instructors name was Mr. Comstock. We used to call him “Good Old Mr. Comstock.” He was a big man with a whole lot of patience. He was also one of those individuals that you didn’t want to mess with, especially if he yelled “Clean Up!” and requested a certain classmate to join him in his office. You knew there was trouble brewing because if that student walked out with a note and was sent to the principal he’d either come to class the next day or would simply disappear. Now I’m aware that the methods used when I attended high school may seem a bit on the cruel side in comparison to present day academic policies, both in student-faculty relationships, but you have to keep in mind though that it was accepted standard in those days. The idea was simple. Empty the barrel before the rotten apples could spoil the good ones. I figured that I better attend thinking that it might affect my grade. So, in a short time we all gathered at the main shop table with Mr. Comstock standing on the other side giving us that strange, half smile expression like he always did, holding a cardboard box, with his fingers gripping the lid firmly as if there were something alive inside. (Looking back, it was a clever deception by Mr. C to gain our attention). Then, he slowly placed the box on the table in front of us and cautiously removed the lid. In a micro second there was a blinding flash! We all huddled together staring into the box in amazement. The effect was spontaneous. The damage complete. Mr. C’s diabolical plans to inspire his students was working far beyond his expectations. It was an awesome sight! The contents that the shoebox held an assortment of genuine, Native Indian stone artifacts such as arrowheads and all sorts of tools, great stuff to examine and what a surprise! The most exciting part was that they were all discovered in Passaic County! Right in our own back yard and I’ll tell you, for us guys this was an unforgettable sight and one always to remember. I am a survivor of that eventful day and the scars of the aftermath are still visible. I’ve been told that the initial blast had produced such a psychological effect that at present there isn’t any cure available known to remedy my condition. So I’ve been condemned to a fifty year regiment of constant therapy-writing dozens of site reports (one by the way I recently submitted to the Passaic County Historical Society) and newspaper articles on the subject of local Archeology, visited scores of Prehistoric sites in New Jersey and New York State successfully have accumulated thousands of Native Indian Artifacts from our area of Passaic County and the tri-state region, and self-published a volume on my experiences “OH”, the torment my disability carries. But there is always the brighter side that makes my pain worth living with. I discovered a true friend Mr. Richard Comstock, he still remains my mentor and guide throughout all my adventures over these many years. When I thought this article was completed I visited one of my acquaintances for a read over of course she dropped a bombshell when she said, “My friends younger boy would like to meet you, he’s a foster kid so be nice”. Stephan Woll is the Former Resident Archeologist for the Basket Historical Society in Long Eddy, New York. Photo: Recreation of the shoebox and its contents. 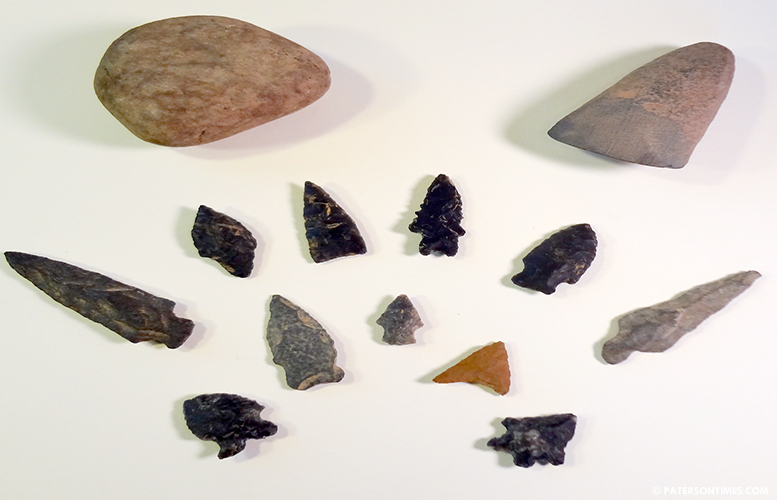 Far left Pitted Stone Hammer, far right Celt Axe, center area is an assortment of projectile points. The larger tools Hammer-Celt Axe were gifted to the author in 1965.